Blue Collar Cleaning was founded in 2013 by Nick Traweek and Dani Griffith in an effort to bring a family together. 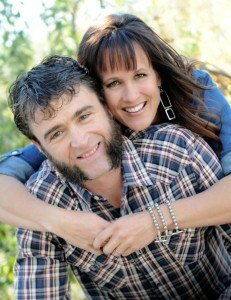 Nick lived in Cortez and Dani lived in Pueblo. In May, 2013 Nick purchased a carpet extractor and 2 air movers and started cleaning floors from Pueblo to Cortez and in between. Since that time, Blue Collar Cleaning & Maintenance has grown by leaps and bounds with the addition of numerous commercial accounts including, but not limited to, Maurices, Petco Farmington, Primetime Pueblo, Mesa Lagree’s Market, Center for American Values, Shilo’s Steakhouse and more. We have 3 rigs we can run at any given time to service commercial or residential accounts, including floor burnishers, autoscrubbers, a 13 Horsepower hot water power washer, a truck mount with 300′ of hose and much more. We can travel and service accounts anywhere near the Highway 160 corridor from Colorado Springs to Farmington, NM. 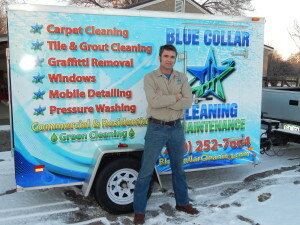 Blue Collar Cleaning & Maintenance is insured and bonded. We accept all major credit cards and specialize in green cleaning. Our staff are hard-working and take pride in a job well done. We know the importance of clean floors and windows, whether it’s for your families well-being or your customers. Give us a call for a quote. We’ll work hard to provide you a competitive quote with timely and friendly customer service. Blue Collar Cleaning’s truck mount extractor for cleaning carpet, tile and hard floors. 2 Responses to "About Us"
Job well done! You guys are the best! !We would have you back anytime Very Happy customer.